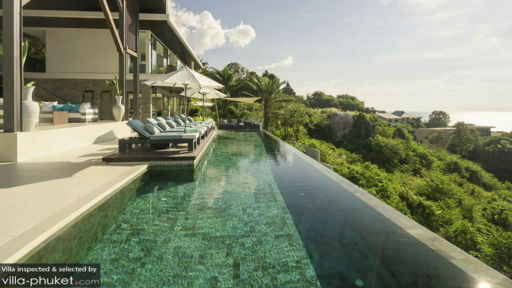 Where the ocean meets the land in mesmerizing Phuket, is where you will find the expansive and contemporary Villa Samira, which means ‘cool breeze’. The six-bedroom luxurious private villa is a fusion of contemporary and traditional Thai accents, accentuating the aesthetically pleasing and highly-decorative architecture including the archway that leads inside the villa. The indoor-outdoor aesthetic of Villa Samira will provide you with the best of both worlds in terms of comfort, ease, and most importantly tranquillity. The master bedroom is the most spacious and richly designed room with its private terrace, Jacuzzi plunge-pool and a king-sized bed. Gorgeous views mark the periphery of the room and the en-suite bathroom has an outdoor bathtub and a shower. The master bedroom and three other rooms are on the upper floor, and these rooms also have en-suite bathrooms with ocean-facing bathtubs. The two remaining bedrooms are located on garden-level with direct access to the outdoors. These too boast of en-suite bathrooms with tropical showers and bathtubs. 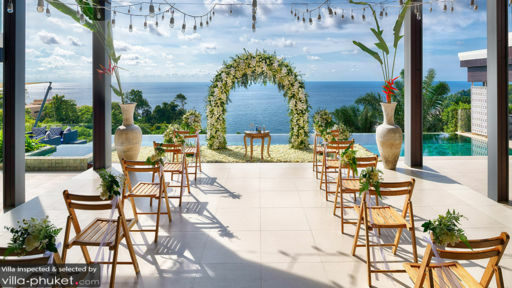 The island of Phuket is the backdrop for the glorious Villa Samira, and the majestic ocean sits in the distance as you relish its beauty from the comforts of the villa. The 19m infinity-edge swimming pool is facing the ocean, so you can be blissfully attuned to the tropical paradise as you calmly float in the cool water of the pool. After a refreshing dip, you can lounge on the sun chairs beside the pool that are kept under the shade of large umbrellas, which are even perfect for a nap or just to immerse yourself in a good read. The beautiful sunny panorama still occupies the canvas as you glance and relish the remarkable scene. The living area at Villa Samira is nothing short of magical as it is placed right in frontal view of the ocean in the distance. The sprawling open plan space with an arched roof, complementing Thai tradition and hospitality, is furnished to perfection with the utmost comfort, luxury and ease in mind. There are several super comfortable couches and sofas comprising the sitting area, with shades of aquamarine to highlight the exotic ambiance of the island. The space is exquisitely designed to bring out the best of the villa at every nook and cranny. There are potted plants to add a tropical vibe and for even more fresh air. A media room with a projector screen and a pool table is also accessible. Just beside the sitting area is an aesthetic space with an indoor pond with pots and benches around. Another space houses the kitchen and dining area with a fully-equipped and stylish modern kitchen. The 12-seater dining table again sits facing a glass wall offering magnificent views of the island and the blue cushioned chairs add a pop of colour to the otherwise neutral tones in the room. The opulent space is absolute luxury and comfort at its very best providing the guests the best way to spend their holiday with their friends and family. While you stay at Villa Samira, you will be awestruck by the excellent services provided by the staff. There is an in-villa chef to delight your senses with culinary treats, a villa manager to ensure smooth functioning, and a massage room for treatments and relaxation. 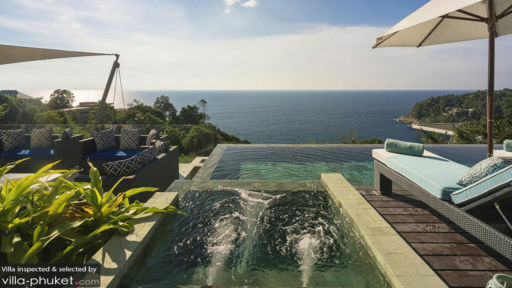 As part of the luxurious stretch of Cape Amarin, Villa Samira is in a prime location on the ‘Millionaire’s Mile’ between Kamala and Patong beach. You can indulge in watersports while on Kamala beach as it is a popular destination with tourists! Patong beach is excellent for parties and some great fun with its beach clubs and diners.